A magnificent large Antique Library Table by Holland & Sons (name stamped to drawers on each side). This Antique Mahogany Library Table dates from 1870 and has significant provenance being stamped in no less than 4 places on the frame with the Crown VR marks and also in a further place by the Crown and GRV (see gallery photographs). Correspondence with the Victoria and Albert Museum has confirmed that such stamps indicate that this Library Table was inventoried on several occasions in a major public building (s) during the reigns of Queen Victoria and King George V.
Holland & Sons were appointed suppliers of furniture to the Crown during Victorian times and the quality of workmanship is evident in this magnificent six drawer Antique Library Table. Locks and castors are all matching and original and are made by Cope and Collinson (see gallery photographs) a well known firm who only supplied fittings of the highest quality. These fittings have helped date the Library Table to the period 1865-1870. 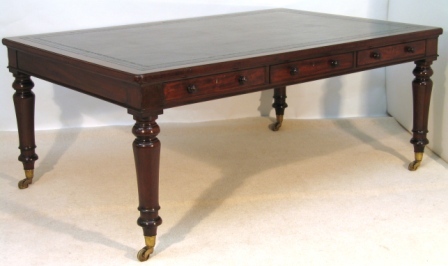 This highest quality Antique Mahogany Library Table is in wonderful condition and is all original with the exception of a replacement top quality black full hide writing surface.